Well, here I am, right after making a big to-do about reviewing a book by an author I know–reviewing another book by an author I know! Who knew I knew so many authors–and, happily, such good ones, too! In the interests of full disclosure, then, Meg Federico is my near neighbor here in Halifax, and while I am still only looking forward to meeting John Cotter in person, I have chatted with Meg many times, and I thought it was about time I read her book. I’m glad I did: it’s both funny and touching. Ornella often answered the front door to find a deliveryman with a TV set and a case of scotch. Mom couldn’t see well enough to dial the phone, but Walter could. Together, they called liquor stores and placed large orders. The stores were only too happy to oblige and took credit cards over the phone. There were fifty liquor stores in a twenty-mile radius. I called as many as I could and asked them not to take Walter’s orders. But I couldn’t get them all. If it wasn’t booze, it was TV sets. Walter was having trouble working the remote, so he thought the set was broken. And unfortunately, he couldn’t remember that he’d already placed an order, so more TV sets kept showing up. That made him very angry. “Who thinks they can send us these things?” he said. The UPS man and the FedEx lady became regulars at the house. “There’s two more TVs. What do you want me to do with them?” Ornella asked me, a million miles away in Canada. I added “Return Unusual Purchases to my list”. Walter started out the following day with his usual round of breakfast gin and tonics. Mother fell. As Ornella lifted her, Walter launched a two-fisted frontal assault. Ornella managed to duck the first punch, but the left hook caught her on the jaw. Edward [Walter’s helper] was nowhere to be found. Ornella called the police, who called me in Halifax. Walter, Edward and Ornella were shouting at one another in the background, punctuated by Mom yelling, “Stop it!” at the top of her lungs. I resisted the impulse to say, That would be ideal. The police are called again later, when Meg and the staff intervene to protect Addie from Walter’s disinhibited lust. During one of Meg’s frequent visits, she gets the lock fixed on Addie’s door; later that night, Walter beats at it yelling “I want my Bride!” and eventually “take[s] a whack” at the worker trying to dissuade him. Someone calls 911, but then Addie refuses to file any charges. I went absolutely hollow. If I’d thought I might be welcome, I was mistaken. Mom kept me standing on the steps. She said through the screen that she had company, and they were just sitting down for dinner. “You have to understand that now you are a guest. You come home when you have an invitation,” she said. But it dawned on her that she could not really send me away, and she let me in. One morning when I arrived for my monthly shift, Mom scuttled towards me, rolling her walker. . . . Mother’s blank and dull face lit up like a sunflower. “Meggo, dear!” she said, with a huge toothy smile, lurching at me, hugging me, and ramming me with the walker. She was so glad to see me, pressing her face into my shoulder, gripping my arms. To share a moment of simple uncalculated love, my mother had had to become a dependent old lady with a dismantled intellect. 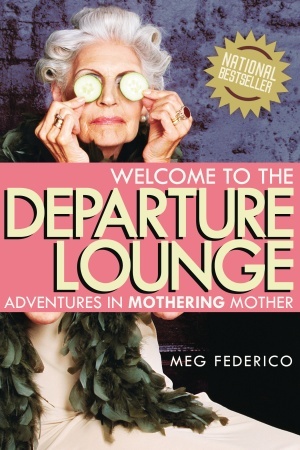 During long dreary days at the Departure Lounge, Meg comes to understand her mother better, seeing her “in a new light, one that illuminated the background.” Those moments of connection are intermittent, broken by Addie’s drifts back into confusion, but they help Meg think differently about her own role as both daughter and mother. The story moves towards its inevitable conclusion. Even then, however, in what the book urges us to see as the paradox of real life, there’s no tidy separation between laughter and grief. Addie dies even as the caterer is arriving with the supplies she had ordered herself for her birthday party, and her passing is marked, not with dignity or heartfelt tears, but with a ridiculous struggle with the EMS team that arrives to “pronounce,” who will not recognize the DNR order as legitimate and hassle the family about liability as Meg holds off them and their defibrillator. At the wake, poor Walter is brought in to see Addie in her coffin and can’t grasp the situation: “Why is that woman asleep at this party?” he asks innocently. Like so many moments in Welcome to the Departure Lounge, this one makes you want to laugh and cry at once. Admiring the hard work you put into your blog and in depth information you offer. It’s good to come across a blog every once in a while that isn’t the same outdated rehashed information. Wonderful read! I’ve bookmarked your site and I’m including your RSS feeds to my Google account.